Please know that our hearts, thoughts and prayers are with you during this time of sorrow. I am the son of 1/Lt. Felix Yapit, US Army, Ret, (May 1, 1911 – Dec 14, 1999, 57th Infantry, Philippine Scouts -- Fort William McKinley, Rizal Philippines). He was a Bataan Death March Survivor and was sent to Camp O’Donnell concentration camp, nearby Capas, Tarlac. Laid to rest at Fort Riley, Kansas. Subject: CPW Prayer 2013-03-017 LtCol EDWIN RAMSEY, 26th Cavalry USA - prayer for R.I.P. Lt Colonel EDWIN P. RAMSEY- a prayer for R.I.P. “Our Father God in heaven, the Author of our beings, we adore You and we praise You. Your power brings us to birth. Your providence guides our lives and by Your command, we return to dust. We now pray for a World War II hero and advocate for Filipino WW2 veterans LtCol EDWIN RAMSEY who heard the call of his Creator, gave his last salute and departed for his appointment with God. Lord, it is not every day that we are privileged to pray for a war hero. This is the day that You have made for us to pray for him and his widow and family. May we pray for LTC Edwin P. Ramsey, R.I.P. There will be a Funeral Mass and Memorial Service on Thursday, March 14. Viewing at 10:15, and Memorial Service at 11:00 AM at St. Paul the Apostle Church located at 10750 Ohio Avenue, Los Angeles CA. 90025.
remarkable spirit here among us forever. the helping hand he so often extended to others. Unable to attend the memorial for Ed and Felipe Fernandez, I held my own little ceremony for them to pay my respect. 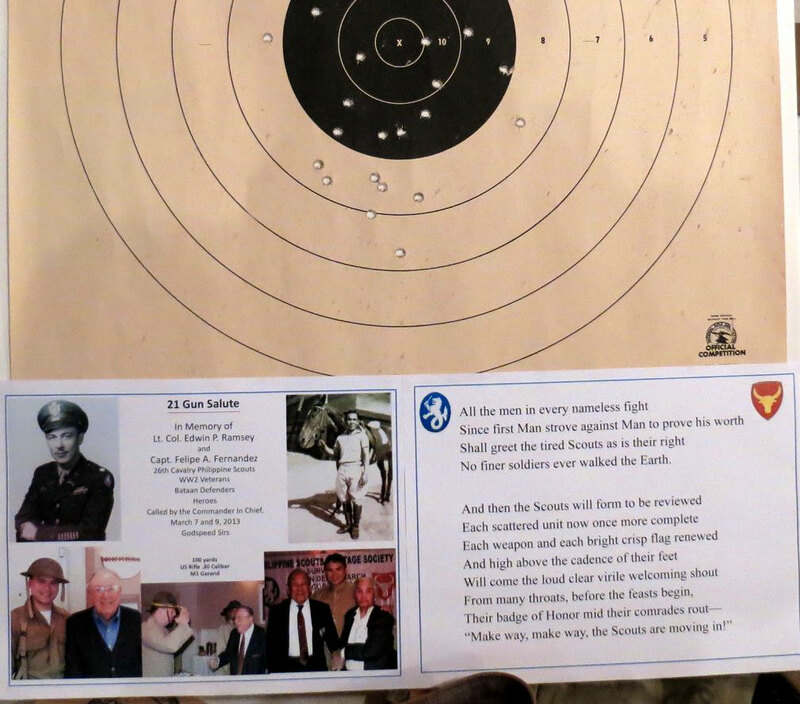 Last week I went to the rifle range and shot 21 rounds in honor of them. I mounted the target as my tribute. Please pass on any information about the Arlington ceremony for Ed when you find out. I will try my best to be there. I mailed you a mass card for Ed as well. I will be at Arlington on June 28th as America honors Ed Ramsey, an extraordinary warrior. I met you several times at reunions (San Francisco, Santa Barbara) with your husband, and had the opportunity to talk with you both. I am writing a novel on the fall of Bataan, and interviewed Ed several times on his exploits and activities during WWII in the Philippines. At the conclusion of one of the events, I vividly remember thanking him for his service to the country, and added, "You are a true American Hero." He blushed for just a moment in a boyishly modest way, and it gives me goose bumps even now to have shared that moment with him. I am sure you are very proud to have been associated with such an individual. I hope he was a good husband, and human being, as well as a real War Hero. He impressed me as a modest, unassuming man who did his duty as he saw fit. As historian William Bartsch put it, Our nation should never forget the sacrifices of those men in the Philippines even though they had been defeated. They did the very best they could and "They Fought With What They Had." ( the title of that book ). As MacArthur opined, "No army did more with so little." I will be unable to personally attend Ed's final moments at Arlington. But on that day, I'll spend a quiet moment in reflection, tribute, and gratitude for having known him, and the sacrifices he made, as truly one of America's "Greatest Generation.". May the good Lord take Ed to his resting place in Peace, and he may finally join so many of his comrades who have gone before him. If there is any hereafter, I hope his reunion will be a pleasant one. And in the celebration of Ed's life and military career, it is sometimes overlooked that there are family who are left behind. I wish for you, too, peace and comfort that Ed had many more good years left, with you; that his death, hopefully was a quiet and peaceful one; and that you may summon the strength to go on; not alone, but surrounded by the good will and best wishes from all those who have known you both. Thank you for forwarding the info. I received a similar letter from Raqui the other day and felt sad that the date coincides with the day I am leaving for Rome to catch my tour (Italian Dream) with Trafalgar that starts on the 29th. I was thinking of flying out of DC for my trip to Rome but I have a friend traveling with me and I'm afraid she may not be willing to pay for the additional cost to fly there. It would have been easy to make this arrangement as we haven't booked for our flight yet. Also it will be possible for us to just meet in Rome, but I was the one who convinced her to come with me that to change our plan may not be a nice thing to do. Besides, she's now in the Philippines and may be difficult for me to communicate with her. Could you please share me your thoughts on this, as I would really want to be at the interment. I will be seeing Raqui at the PSHS (Philippine Scouts Heritage Society) reunion in Tacoma, WA on April 13. This was planned way before the Colonel's demise that they were already booked for this affair and have asked me to be there, too. She is going with one of Col. Ed's son, Doug. Re Raqui: She is mestiza Filipino-Spanish but very Filipino. She holds a PhD degree and heads the English Dept. in the Beverly Hills school district. She used to teach at the IS and UST in Manila. She is about 30 years the colonel's junior and they have been married for 33 years. They met in Manila and lived there for a while until they moved to LA. Every year they spent Chrismas and their wedding anniversary in Hawaii. They also went on long cruises during summer for 30 days or more and in fact, Raqui who is retiring this year had booked a 92 days cruise this September that would have taken them to Southeast Asia, Australia and New Zealand with stops in the Philippines and countries the colonel have lived. She doted on the colonel and in his death bed, he worried over Raqui's health as she was always at his side. Raqui is a very nice lady and a very loyal friend. I hope she will hold up well and have the strength to carry on. About Col. Ramsey in his visits to the Philippines... after the war he made regular visits and was honored by the different Presidents. On one occasion his whole family came to visit us in San Carlos. The oldest boy, Ed, Jr., who was 14 then, told me he remembers his visit with us and the reunion of the Pangasinan-Tarlac Military District (PTMD) held at home which he called "fiesta". A lot of officers and men from the ECLGA (East Central Luzon Guerilla Area) were there for that occasion. Unfortunately, the 2 other Americans we hid for a brief period in our house couldn't be there as they were caught and beheaded in Sual. Captain Charles Putnam was named by Col. Ed the commanding officer of the PTMD but when he died sometime in 1943 my Dad took over the command. I remember Capt. Putnam as a burly older man who loved to attend wedding/baptismal parties in the barrios, loved "bisocol" (escargo), was outgoing and had a loud voice. He even called me the "little Rebel" which I sort of relished that I still remember it until now (LOL). The other American with him was Lt. Darwin, a 21 year old pilot . Eventually they were caught by the Japanese and confined in the garrison in Dagupan. Everyday as I passed by them I would see each one tied down on a chair under the blistering sun. They would then look at the Japanese guard and if the guard wasn't looking, they would both wink at me. This was when I visited my dad who was confined at the Pangasinan Provincial Hospital after his incarceration for a month by the Japanese "kempeitai". After several days, however, I didn't see them anymore and that must have been the time they brought them to Sual. Capt. Putnam left an address of his family in the States with my dad, but he didn't receive any reply when my dad wrote them. I was thinking of searching the internet if I could trace their families. Won't it be nice if I can tell them of what I remember about these heroes? I'm telling you all these stories, Ping, as I know you are into the history of Pangasinan that although this is just a teeny weeny part, it might be of some interest to you. Again, many thanks for updating me. I am Capt. Menandro and Teofila Parazo's daughter. My parents were involved with the PSHS for many years. They so loved attending the PSHS conventions and cherished the friendship you and your husband so graciously extended to them over the years. I still enjoy looking at the pictures from each convention that included the four of you. They always spoke of the two of you with great love and affection. Please accept my heartfelt condolences on the passing of your dear husband, Lt. Col Ramsey. My husband Rodney Booth and I will travel to Arlington to take part in honoring this great soldier. We will be staying at the Sheraton from June 26-30 and will attend the ceremony and luncheon as well. Both my parents also rest at Arlington National Cemetery and one of the most poignant moments of the ceremony was listening to the bagpiper at the end of the ceremony. If you would like the bagpipes at the end of your husband's ceremony please allow my family to take care of the expense for that. Music was such an important part of my parents' lives; I know they would be pleased to honor your husband with music. Mrs Ramsey, as I think you know I worked with Ed when I was in our Tokyo Embassy 60-64. A very fine gentleman I knew and worked with for several years. His book, “Lt Ramsey’s War” is still well worth reading. I’ve purchased several copies over the years as gifts to others because it tells about a valuable period of US history and a time when the Japanese were doing their best to capture him – but didn’t succeed. Col Bill Millis USAF ret with 92 short years on this earth. I awoke this morning and realized my love has been away from me for one month, April 7. And so will my brother, Paul, Adriana, Daniel & Amy as well. Please say a prayer for my love, Ed on this day and pray as well for me for strength to face the next months and years. May God bless you all for being by my side all these days. His stature wasn't that large, but he as was a giant of a man. He was a real HERO, not one concocted by Hollywood. He was a gentleman and a friend to all, never passing up a chance to speak to a stranger. In fact, that is how we met Ed and his beloved Raqui, as complete strangers, sitting side-by-side at breakfast on an ocean liner, he broke the ice and we became friends. We have cruised together and we have met in Hawaii at the Hale Koa at Christmas, two of his favorite things to do, but we will always remember him as a dying breed, a generation that we are proud to have known and been a part of. it is sad to say but the children of today will never experience HEROS like Ed, yet they owe their mere existence to Ed and others like him. We are eternally grateful for his sacrifices and for the life he led. Raqui, our thoughts and prayers are now with you, and we know words are of little comfort; only time will ease your grief. You have so many memories that Ed will live forever in your heart. Your fellow Chapter members wish you a bon voyage and we are at peace knowing that you will be meeting up with all your honored comrades. We will forever continue to use what you taught us on; COURAGE, LOYALTY, TRUST, NOBILITY, RESPECT AND LOVE OF FREEDOM, COUNTRY AND FAMILY. LTC Edwin P. Ramsey -- We honor this great Soldier, Father, Husband and Hero. We will never forget him, his heroism is a legacy that will live on forever. The Philippine Scouts Heritage Society will assure that his name will remain in the forefront of our Nations Most Honorable Warriors. They are our inspiration.